@Romi's Studio: Is It Monday Already? Thank you all so much for the kind comments on my little cutie. He is an amazing person and I am learning so much from him. So now that he is the ex-Dr. Destructo, what nickname shall I give him here? Any ideas? Let me know, 'cause I am fresh out of cleverness, I'm afraid! 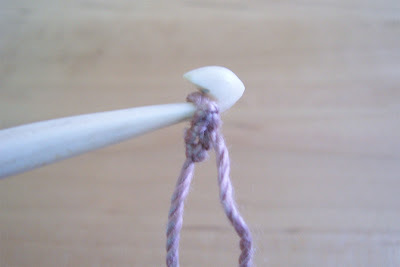 What I can show you, however, is my favorite provisional cast on technique: crocheting onto a knitting needle. So today is Tutorial Day. To begin, choose a smooth cotton yarn. I suggest a color that is fairly obvious against your knitting. In other words, don't use black cotton if your main yarn is black. I use mercerized cotton from the local craft supply store. Do not use dishcloth or non-mercerized cotton. The fibers catch on your main yarn and you can have big problems untangling it when you rip out the crochet chain. With a crochet hook, chain two or three stitches. Use one that feels comfortable to you; don't worry about size of the the hook. 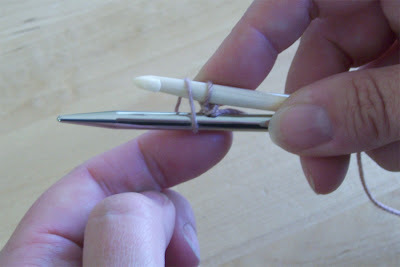 Next, lay a knitting needle alongside the hook and wrap the yarn over both needle and hook. I hold the yarn in my left hand while doing this, and the needle and hook are both in my right hand. 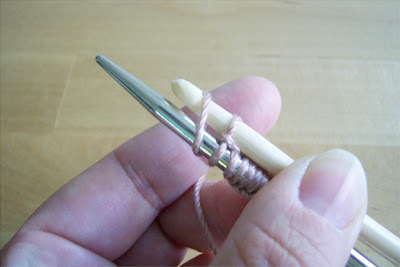 Pull the yarn through the loop on the crochet hook. When you are finished, just knit into the stitches on the needle with your main yarn, and you're off to the races! Can I just tell you how much easier this is than picking up stitches from a chain? I could never get the correct loop, and then I would have to cut pieces of the chain out when I tried to unzip it. 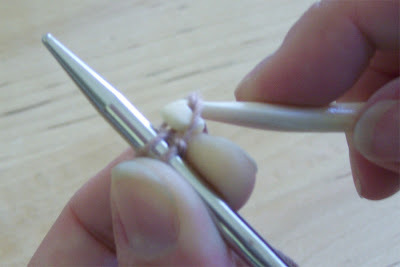 This chain just comes straight out with no problems, and when I go back to pick up the stitches from the cast-on edge, I just unzip the chain one stitch at a time and stick the live stitches, one at a time, onto my needle. I may be a bit quiet this week, but I'll try to drop in a few times! My son is Bug, Bugbug, mouse, Henry penny ... sometimes he even addresses himself in third person as Mouse. Thanks for the tutorial. This will work great with lace shawls. Awesome--truly. I need a provisional cast on for my next project, and I'm not in love (to put it mildly) with any of the ones I've tried before. I will definitely be giving yours a shot. Thanks! I've been doing something but different. :-) This is MUCH better -- thanks so much! Thanks for the lovely pin (from your contest a while back). More beautiful in person! Since I haven't knit myself a lacy shawl yet, though, I'm going to have to wait to try it out. Next on my list of new things to try - lace shawl or stole! Thanks for the tutorial - I will be back to utilize that in the future! Can't wait to see what you're up to. That must be the hardest part of publishing - the secrecy of all the great things you're creating! Great tutorial!!! Thanks. I called my baby, who is 22 now, angel baby when he was little. I am filing that under useful information. Thank you. I vote for Little Wise Man! Rosemary- I NEVER use a provisional cast-on- but I may change my evil ways after reading your post- thanks. there is no apparent reason for this. Hope you feel better after the KSH knitting days ! You certainly deserved it. Ooooh - that looks like a great tip. Definitely one I'll try next time I need a provisional cast on! Thanks for the tutorial! I have a future project that needs a cast-on like this, so this helps A LOT! That is a SUPERB idea!!! THANK you!!! Whodathunkit (shaking head.) Of course. So immediately intuitive, the second I looked at the picture. Again, thank you! My 5 year old sounds so much like your son!!! Amazing, really. Mine is Imp, "D", monkey...but you are looking for something more descriptive of his heart, I think. Maybe King of Hearts? I saw your pins in Crochet magazine yesterday. Good for you!!!!! I'm so happy for you! I used this crochet cast-on the one time I have tried a provisional cast-on and loved it...at first. When it came time to "unzip" and pick up the stitched to knit in the other direction, I found they were twisted every which way! Perhaps I did something wrong??? I know that I didn't make any extra stitches in the original crochet part; perhaps that was the problem? My Little Cutie for your 4-year-old and My Big Cutie for your older son. Love the tutorial! Now, that rates up there with the...why didn't I think of that? Thanks for the pictures..they really help understand it a lot! Your story about your son is so sweet, what an awesome demomonstration of forgiveness. Coolio! I'll be using this variation on a provisional cast on from now on -- it makes so much more sense! Oy. This is awesome, and very, very clever indeed! Thanks for sharing this tut, I will *so* try it out!! You are a genious! I have been holding my knitting needle in the wrong hand! This worked like a charm! I'll be using it again. Thank you so much. Thanks very very much. This works like a charm! This is soooo clever and so much easier than I dreamed. Love it, thank you. Will use it on my EZ BSJ so I can extend the sleeves. Was going with 3/4 sleeves, now I don't have to. Great! Also, love love LOVE this cast on. I love the fit of short row toes, but when working toe up chain provisional cast on's can be such a hassle. this one looks infinitely easier. Thank you for sharing. :) This just might help save what little of my sanity is left. ahhh I see! thanks !! OMG, thank you for thie provisional cast-on! I have done the "pick up stitches through a crocheted chain" with exactly the results you described - spltiting the yarn, having to cut the chain out of the stitches, etc. Very frustrating! I had gotten to the point where I dreaded anything involving a provisional cast-on - but because I love knitting lace, and especially lace with beads, I persevered. This is sooooo much easier! No split yarn, and a lot less frustration for me. Wheeee!